The last of my writes-up on Eric Fuller’s latest offering is an unusual pair of caged burrs. They were designed by different people at about the same time and they share a common cage – so Eric has produced them as a set with a single cage and two pairs of burr pieces. 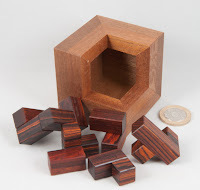 The common bit, the cage, is made of walnut and uses some nifty shouldered joints to make sure that enthusiastic puzzlers aren’t left holding a pile of pieces when trying to extract those three little burr pieces. 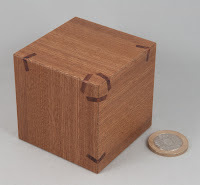 It’s a simple 6*6*6 cage with an outer ring on each side and a 2*2 hole in the centre. Then there are four interfering cubes in the middle layer of each face that are either offset clockwise or anti-clockwise around the face in such a way that opposite sides coincide ... a few designers (not just these two!) have employed frames this shape in their devious pursuits. 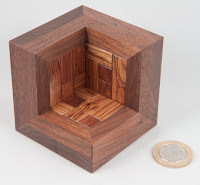 Ghidorah Box was designed by Yavuz Demirhan in 2012 and has three dissimilar pieces that Eric has made in canarywood. Eric billed the Ghidorah Box as the warm-up of the two puzzles inasmuch as it has “only” a level 22 solution – although I reckon it’s still a pretty decent challenge. There are only so many ways that you can put the three pieces together in an interlocking form, and then it’s just a case of working out how to get them in that target shape inside the frame from hell! I tend to think of working in terms of degrees of freedom – get as much freedom as you can with the pieces in situ so that you can introduce the last piece and then work them together into the target shape ... sometimes it works! 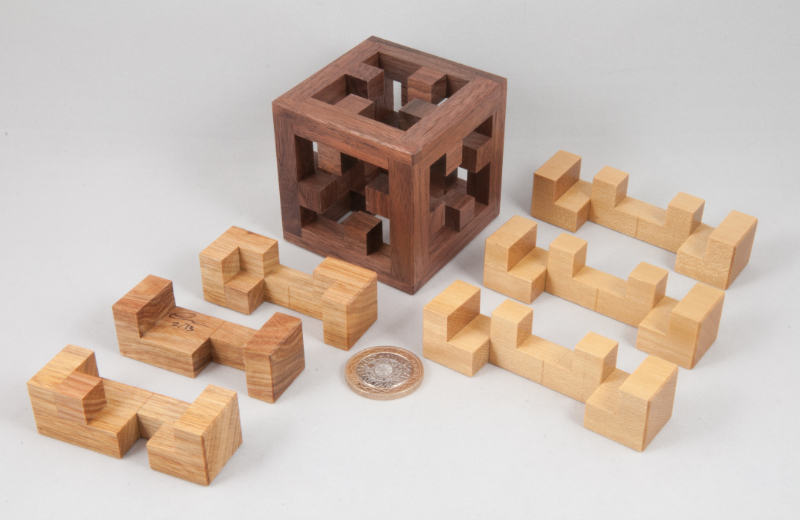 Vectes designed by Alfons Eyckmans uses burr pieces that are two units longer than the frame, so they end up sticking out either end, and generally getting even more in the way during solving. These pieces have been cut from some lovely yellowheart and also fit perfectly in the frame. A couple of the moves in this solution involve some pretty precise positioning of the pieces and it’s pretty clear that Eric has got the fit spot on – get them properly aligned and they move perfectly, have one of the burrs a little off line and it will refuse to slide home... the bevelling on the ends does help with that a little. 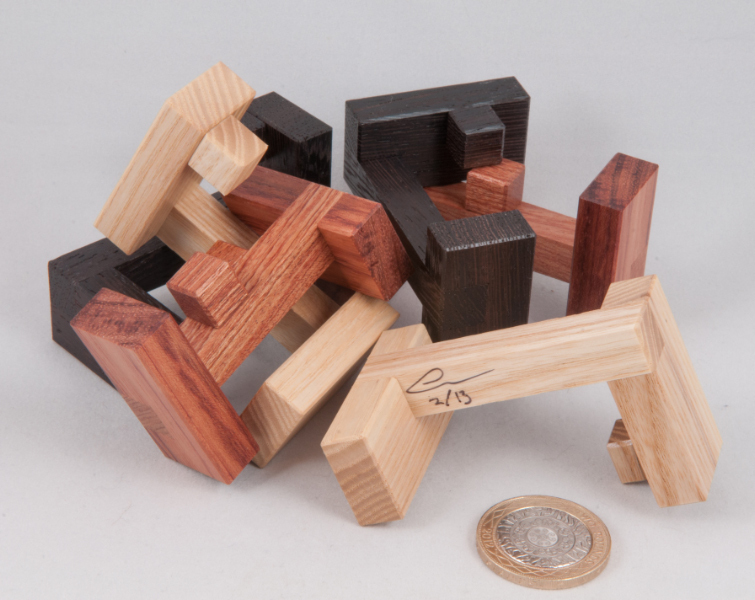 Vectes is the definitely daddy here at level 37 moves to free the first piece and that translates into more manoeuvring to get some of the bits in a useful space to move the other bits around... lovely puzzles that work really neatly as a pair. WELL DONE Eric for spotting the common thread and for producing a pair that go together beautifully. Afterthought: as I was writing up this post my mind went wandering a little and I wondered if it would be possible to mix and match the pieces a bit ... and indeed it is! 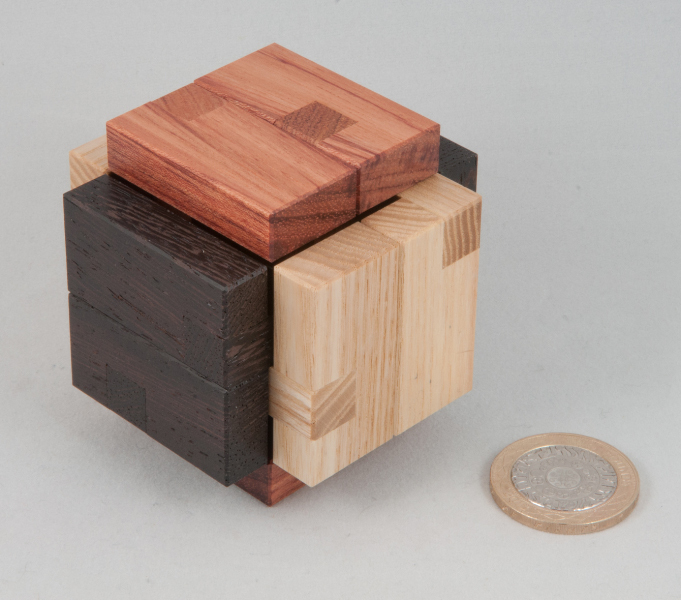 Franken-puzzle anyone? 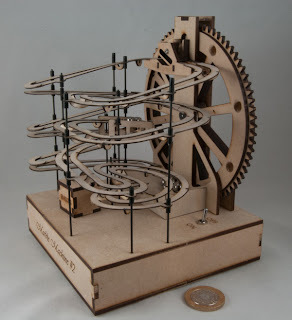 Back in January I wrote about the fun I’d had putting together my Marble Machine #1 from Busted Bricks ... and then during the course of February Michael dropped by the blog and posted a rather teasing link to a new design called, wait for it! 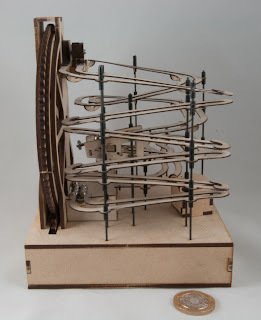 Marble Machine #2. Having had a quick squizz at the YouTube video, I’d pretty much decided that I wanted one so I began dropping by at the Busted Bricks web site on a pretty regular basis (I know, I know! ), until eventually a couple of weeks ago MM#2 went up for sale – and I immediately ordered my copy. As with the previous machine, the assembly instructions are available as PDF files on the Busted Bricks web site making it pretty handy for either printing them out or indeed having them up on the PC while you’re building it, as I did ... and it means that Michael can update them instantaneously if anyone suggests any improvements. The kit is wonderfully complete containing literally everything that you’ll need to complete the build bar some glue and a pair of AA batteries to power the motor. The little bits and pieces (that’s technical jargon for nuts and bolts, pieces of silicon tubing, carbon fibre rods etc.) are all safely secured in sealed plastic bags so you can’t lose anything... and Michael’s pretty much thought of everything, right down to throwing in a small bit of sandpaper and a 15cm ruler for measuring out the lengths of carbon rod. 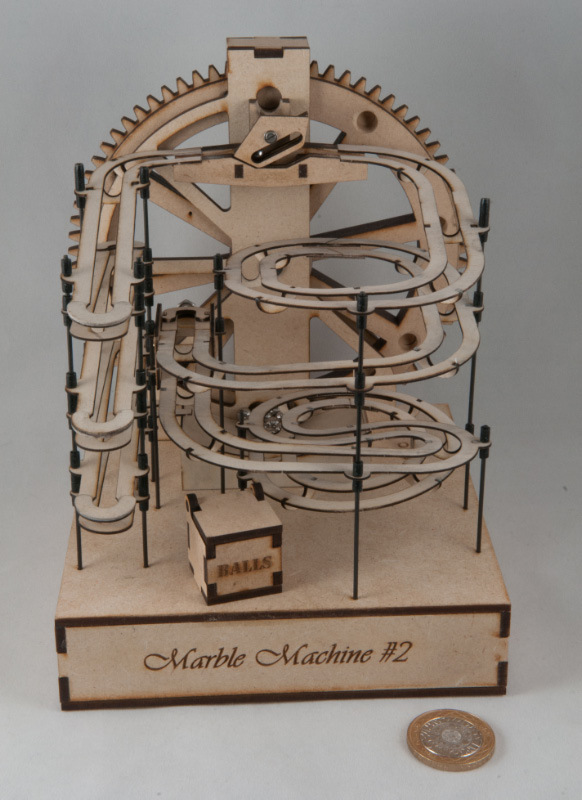 MM#2 has a single large lifting wheel at the rear of the structure that lifts balls from a collector tray on the base up to a flip/flop switch at the top which sends alternate balls down two different sets of tracks. The track on the left is made up of a series of tilted slopes with the balls dropping onto the next alternating slope at the end of each track. 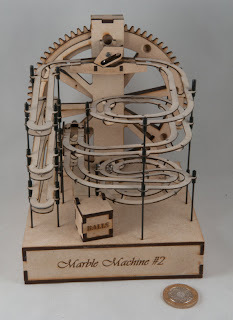 The right hand track has a run more akin to MM#1, except that there’s a little trick halfway down in the form of an accumulator that collects the balls until there are three and then releases them all together down the last section of the track... the lifting wheel is driven by a tiny motor running on a pair of AA batteries neatly tucked inside the base. Assembly starts with the base that is built up of some interlocking pieces that go together rather easily... while that dries (assuming you’re not using CA) you can move onto one of the next sub-assemblies, until that needs to dry and so on – this one has quite a few little discrete bits of work so you can easily find something else to work on while one of your pieces of work is clamped together waiting to dry. Michael’s already done most of the hard work on the lifting wheel which arrives with the holes pre-drilled to the right depth and angle to ensure that the balls not only fall into the holes at the bottom, but roll out when they reach the top of the lift... there’s a little bit of chamfering to do around the edges to help the process, but that’s about all. The flip/flop switch mechanism needs a bit of care to make sure that it is going to flip and flop at the right times – but the design has been pretty well thought out, so it’s hard to mess it up ... and the same is true of the accumulator that relies on a small counter balance to collect the first two balls and then release them all when the third ball arrives in the accumulator tray – I had visions of having to fine tune the counter balance and finesse the hinge mechanism to get it all working properly however it all just worked perfectly, first time – serious credit to the design. Assembling the lengths of track is also pretty straight-forward as the only two sets of joins have been shaped differently so you couldn’t possibly get them the wrong way round if your tried... final assembly of the tracks on their carbon rod supports is a bit fiddly but once you get them started, they pretty much take up their final shape on their own. I found myself fiddling with the spacing a wee bit to get things more or less evenly spaced before I turned it on for the first time and then sat back and watched my handiwork – and it’s terrific! 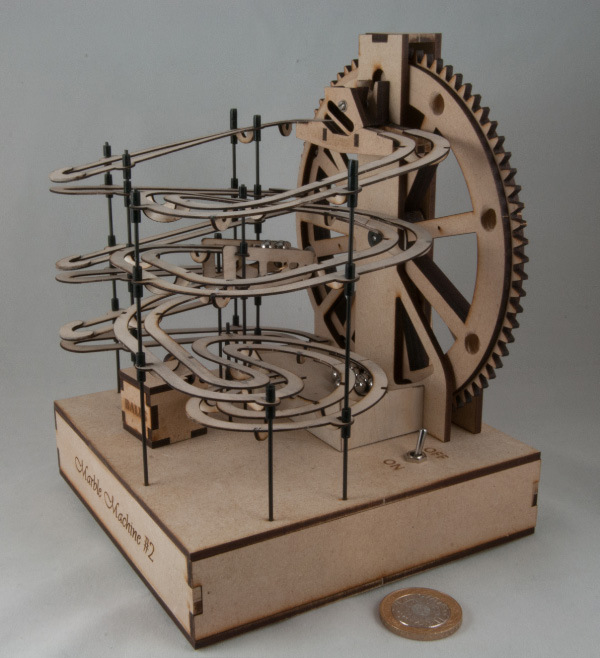 The balls flick left and right alternatively and the accumulator on the right hand track works perfectly ... it’s a great little piece of kinetic sculpture ... thoroughly useless, totally endearing! Michael’s done an excellent job on the design and on putting these kits together. 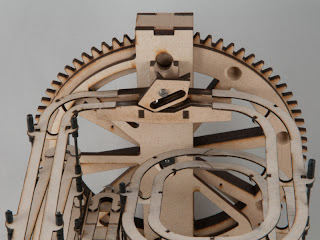 Everything you’ll need is included, down to some extra carbon rod to use as alignment pegs when you’re gluing bits of the base together and a sighting rod to use when you’re lining up the wheel supports. There’s a lot more building involved in this model than in the previous one and I probably spent about 6 hours on and off over the course of a weekend putting it all together – I’m not the world’s speediest builder, but then I enjoy the process as well as the outcome... and I really enjoyed putting this one together... and even Gill thinks it’s cool! The Core and Begonia share a common basic premise (albeit a rather unusual one) of being a 3D packing puzzle where the object is to pack the pieces into a tray shaped like the three sides of the corner of a box. 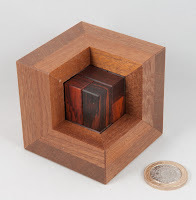 They differ slightly in their target shape in that The Core ends up with a cube emerging from the tray whereas Begonia targets a flat plate covering the three sides of the corner … and Begonia has a little cubie lodged in the back corner to “help” you. Begonia requires you to tile a 4*4*4 corner with 8 pieces – 4 of which have a twist in them so they must go in one of the bends of the three axes … which should cut down on the number of potential possibilities to try, rather a lot you might think! Which is both a good and a bad thing as it turns out – good because there are fewer wrong (almost-) assemblies and bad because there’s a unique solution… and it’s a long way from being a trivial puzzle, as some of my mates can testify to! 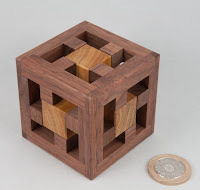 Eric’s made the tray out of walnut and the pieces are rosewood, as are the splines in the box / tray. The Core asks you to build a 3*3*3 cube (almost – there are two cubies missing) in a frame that covers three sides and leaves a 2*2*2 gap in one of the corners. While it only(!) has 5 pieces, and one of them is quite large, this puzzle is also rather tricky given the constraints of having to post each of the pieces through the 2*2*2 hole. Embarrassing side note: Eric ships The Core partially assembled – with one piece separate… and it took me an embarrassingly long time to extract the piece from the frame – it seemed that no matter what I did, they were locked in good and proper … it took me a while to realise that I need to stop some of the hidden pieces from moving in order to stand a chance of getting anywhere – yip, I’m a bit slow on the uptake! 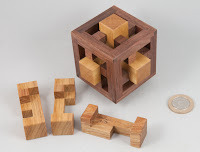 Fit and finish on both puzzles are the usual Fuller-standards-of-perfection. Designed by my mate Derek Bosch, this was one of Eric Fuller’s latest round of offerings. I should stop right there – and I probably would if it wouldn’t make the blog post look rather picture heavy and text light… so I’ll ramble a bit. 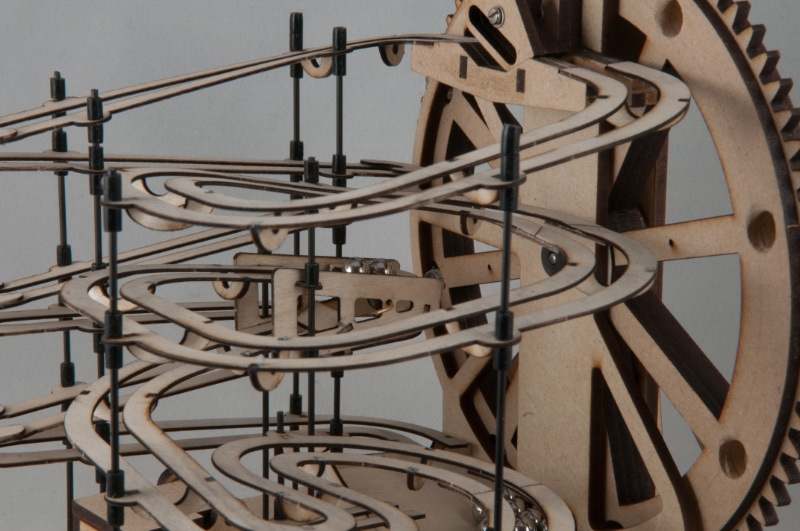 Assembled, it looks pretty benign – almost like a 6-piece board burr with fairly fat boards. However (there’s always a however, isn’t there?) 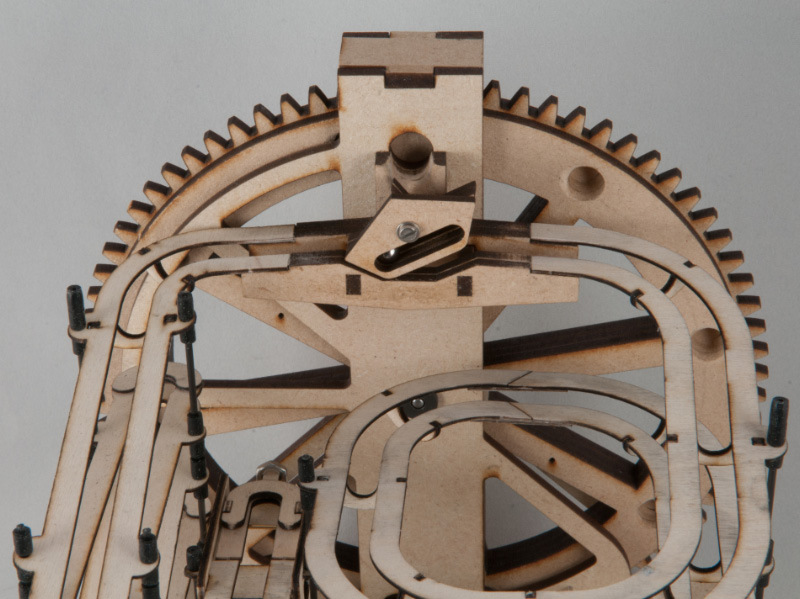 as soon as you start moving any of the bits, it is very clear that this one is rather devilish: each of the ends of the pieces are perpendicular to one another … There was probably a clue to that in the starting shape – if it was a board burr, then the boards would have had to have been twisted through ninety degrees, on the inside. 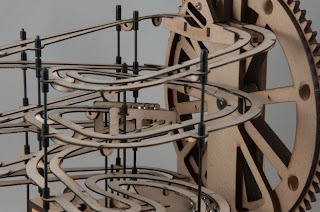 It takes a little while to get used to the movements and the fact that a horizontal plate on one side is connected to vertical plate on the other … I suppose at least they connect straight through, unlike some designs! Along the path to disassembly you’ll find some pieces come tantalisingly close to falling out, yet they remain thoroughly trapped until the 26th (!) move finally releases the first piece … oh and don’t be surprised if you find yourself apparently going backwards and forwards a few times – you might still be on the right trail! 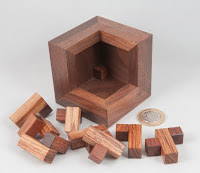 I am not ashamed to say that reassembly without the use of my favourite puzzling software is (well!) beyond my puzzling powers … even Eric’s kind use of three different woods (Ash / Wenge / Bubinga) for the pairs of pieces is not enough of a hint to enable me to assemble it on my own. The pieces look pretty simple, if a little unusual, and yet they produce a wonderfully challenging puzzle. Eric’s done his usual terrific job of creating pieces that not only look great, but fit together marvellously and will stand the test of time (the sticks join the plates in a straight through joint for extra strength). A couple of us told Derek that his design was evil on the Cubic Dissection Facebook group - he took that as a compliment … and he should – it’s a great design, beautifully produced by Eric! Nice one guys! 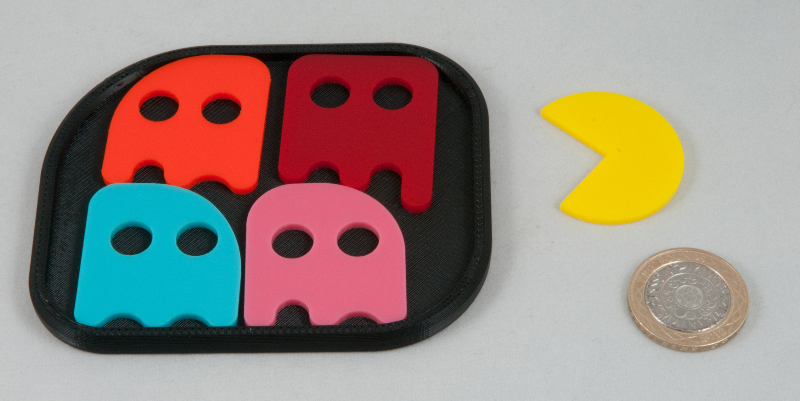 80’s icon meets tray packing puzzle. 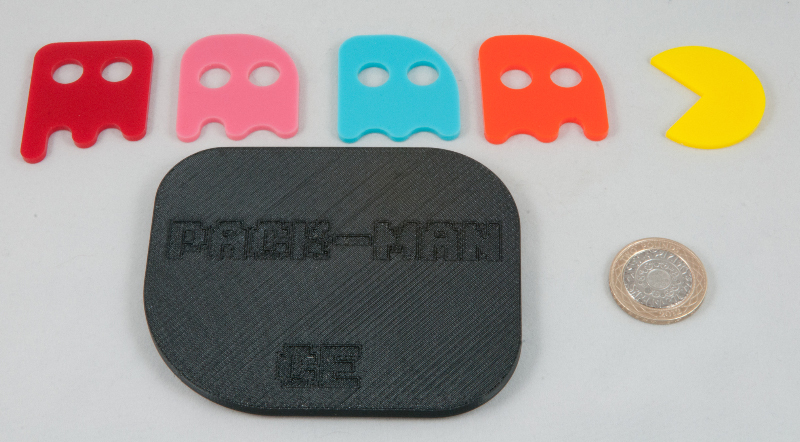 The result is Pack-Man, a puzzle from Chris Enright. The first time I saw this puzzle in the Design Competition room at IPP32 I had a really good chuckle at Chris’ humour in using the Pac-Man characters in a tray-packing puzzle he’d dubbed Pack-Man. ..until I blunder across the one really promising looking combination ... and a little tweak lets the final piece drop neatly into place – success! Shake the tray from side to side and the pieces rattle gently in place – the sign of a good tray-packing puzzle in my books: it seems impossible to get the last piece in until you find THE solution – and then there’s actually a little space spare! 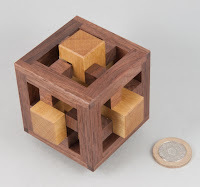 After I’d solved it I sent a pic to Nigel and he immediately challenged me to find the second solution ... so after another 5 or 10 minutes puzzling I sent him another pic with an alternative solution – albeit a slightly tighter one ... then he was happy I’d finished the puzzle.